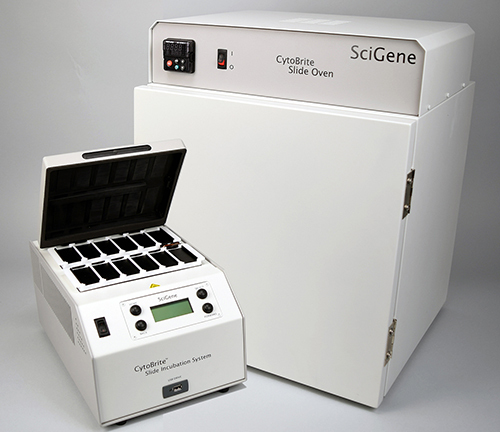 The CytoBrite Slide Incubation System is a high capacity set of instruments for performing FISH hybridization assays. The system consists of one CytoBrite Slide Incubation System for performing rapid probe denaturation on batches of 12 FISH slides and one CytoBrite Slide Oven for overnight hybridizations of 60 slides. The combined instruments hybridize up to 72 FISH slides simultaneously at less than half the cost and bench space of older systems. Removable slide trays streamline work by holding slides for probe addition, coverslipping, and transfers between instruments. Built-in temperature calibration system eliminates the cost of factory or third party calibration required for CLIA compliance.